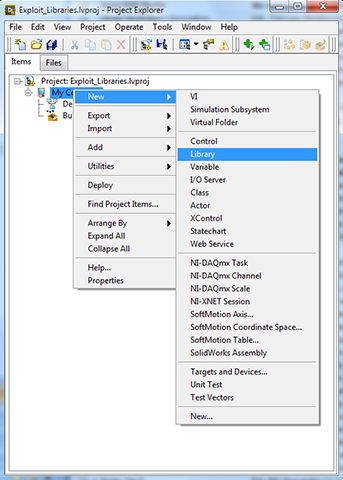 Libraries are a feature available in the LabVIEW project or they can be created stand-alone*. They have a number of features that allow you to specify shared properties and attributes of related VIs and custom controls. 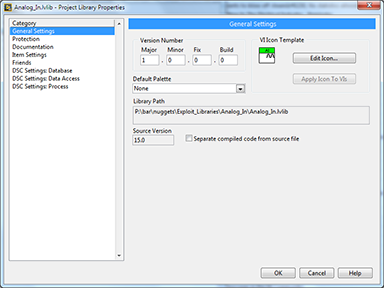 A partial list of the features of a LabVIEW project library is shown in Table 1. You can create a new library from the project by right-clicking the “My Computer” icon and selecting “New >>> Library” (see Figure 2). Save it to a unique folder that will contain all of the files associated with the library. Open the properties screen (see Figure 3) and then open the icon editor (see Figure 4) to compose a Common Icon for the library and its members. 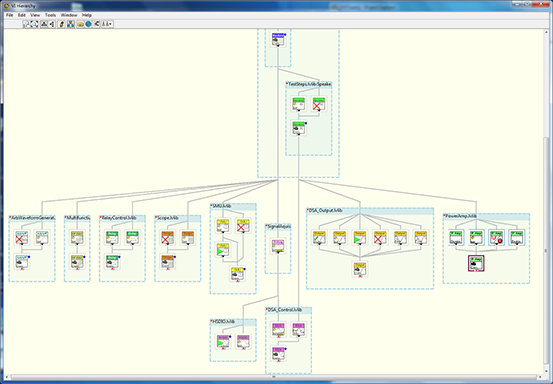 Create virtual folders in the library (see Figure 5) to help organize the VIs contained in it. I usually use three folders but you can use more or less depending on your needs and preferences. I use one to hold the controls, and another pair for the public and private VIs. I do not use auto-populating folders for a number of reasons. I can keep the file paths shorter using the virtual folders while maintaining the structure in the project. Set the Access Scope of the private virtual folder to private (see Figure 6). While the private folder and the setting of the access scope can be optional, taking advantage of this options will help you and the users of your library identify which VIs are not intended for use outside of the library. Attempting to use a VI with private scope from outside the library itself will break the calling VI and make it very obvious that the VI is not intended for public use. In Figure 7, I share a screen shot of a typical project that uses libraries. Some notes for the annotations in Figure 7 follows. A. I used nested libraries (one or more libraries contained in a library) to make it easy to slice off large portions of the project files that were latter used in other project. B. The library containing all of the Analog Input related VIs is named “AI.lvlib”. 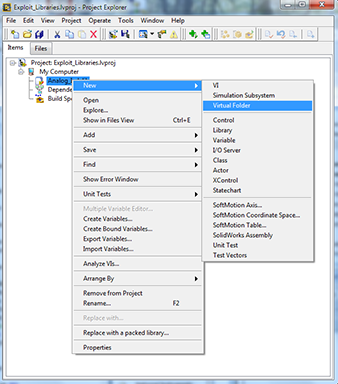 C. The Controls virtual folder holds all of the type definitions used by the library. They can often be ignored when looking for the sub-VI we need, but when we have to revise one of the definitions, they can be found quickly. 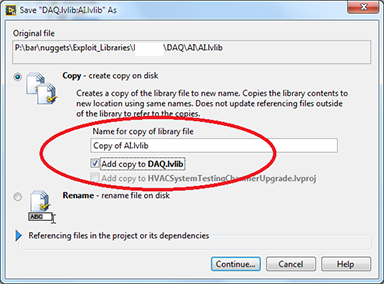 D. The Private virtual folder contains the low level VIs that are required by the library but are not intended to be used directly in an application. Setting the Access Scope to private ensures that any use of those VIs by VIs that are not members of the library will break the calling VIs. Drawing on a quote from an old map often mentioned in the world of LabVIEW “There be dragons there.” Please note the small red key symbols shows the VIs that are marked as private scope. E. In a nested virtual folder contained in the public virtual folder, all of the available “Get” operations are grouped to make it easier to find the functions we need. F. The Public folder contains all the VIs that are available for use by the main application and components. G. All members of the library are located in a single folder. When we clone a library (see Figure 9) we start to harness one of the nice features of a library. 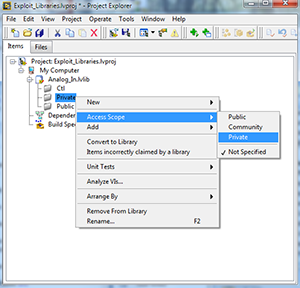 The Save as screen for the library (see Figure 10) will not only let us define the library name but also where in the project the library will be placed. This is handy for nested libraries but not critical. 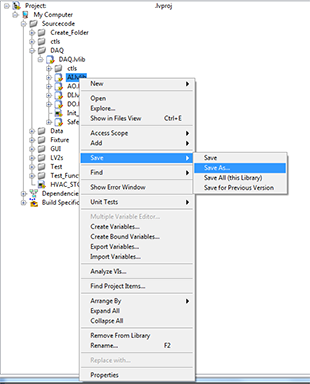 The libraries can be moved around in the project or between libraries as need using the project window. 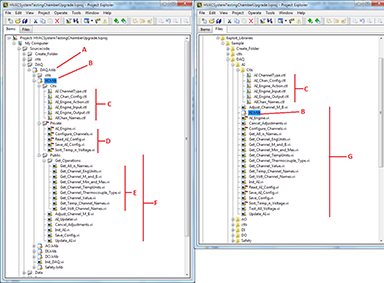 When a library is cloned using the Save As option, all of the VIs contained in the original library are duplicated and re-linked to the VIs in the new library. There is NO chance of cross-linking when Cloning a library! Once the new library has been created I normally will adapt the icon to the purpose and modify VI names to be consistent with the new library. I do have one note of caution to offer before you decide to clone a library. It is a good idea to create a stand-alone tester for all of the functionality supported by the library. Give some thought to possible changes or enhancements as well. Cloning libraries is a great technique that will save you time with the development of subsequent clones provided you have met all of the functional requirements. If we clone a library too early in the development process and overlook common functionality, we may have to duplicate changes made to one library in all of the clones created from the original library. The power of libraries saves us work during the initial development phase but it does not end there. They are also useful when debugging or making modifications required to properly support the application. Relying on the LabVIEW Project window alone can become cumbersome in large applications where there could be thousands of VIs. The VI Hierarchy screen offers a presentation that lets us view what components interact and depend on other components. Viewing the hierarchy of a large application can also be a challenge when trying to find the function we need to investigate (see Figure 11). When we use libraries to group our sub-VIs we can take advantage of a feature built into the hierarchy screen. As highlighted in Figure 12, we can engage the “Group Libraries” button which will redraw the hierarchy with members of the libraries grouped together. The grouping of library members lets us see all of the functions enclosed in a light blue box with the name of the library in the top left corner. The grouping also lets us see the similarity between the organization in the project and their usage. The benefits of libraries may not end with us, but may extend also to those that follow and find themselves having to dive into an application with an understanding of the overall operation. 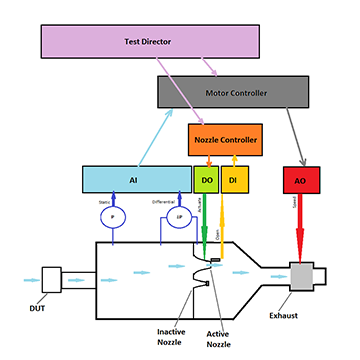 Comparing the high-level design shown in Figure 13 and the hierarchy shown in Figure 14, we see that it is not very difficult to quickly add another nozzle to the test fixture. 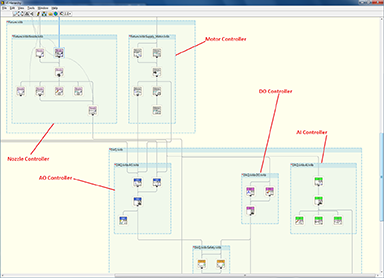 Each of the components of the real system maps to a virtual version in the project. Great post Ben! I certainly wish I had started using libraries earlier on. 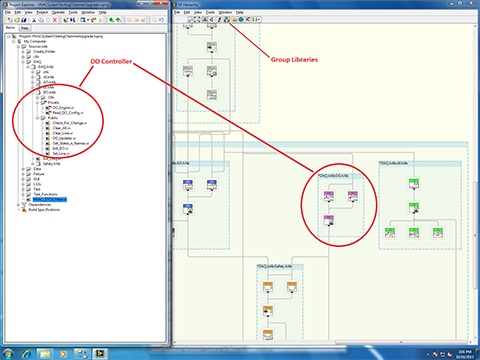 I had never thought about how similar Libraries and Classes are in LabVIEW. I have never designed my own class, but now it doesn’t seem too scary. 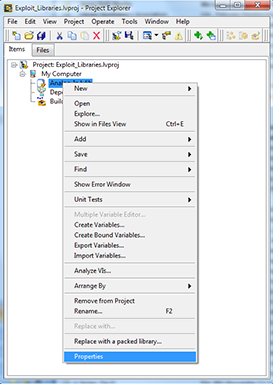 I would also emphasize, always use LabVIEW if you need to move / rename files that are in libraries or projects. Once a VI knows which library it belongs to, it is very hard to make it forget if you move it in file explorer! Using LabVIEW to move the file is part of my normal process, such that I do not even consider doing it any other way. Minor point: I think what you called “name mangling” is more correctly termed “name spacing.” Namespaces (and name spacing) are user-defined. 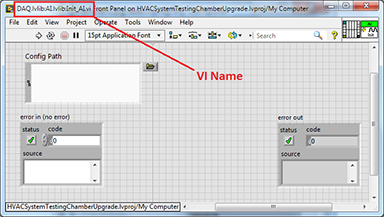 By placing the VI in libraries, you are defining the “fully qualified name” (NI’s terminology, but it means the VI’s namespace and name) of the VI. In your example above the VI’s name is Init_AI.vi, its namespace is DAQ.lvlib:AI.lvlib, and the fully qualified name is DAQ.lvib:AI.lvlib:Init_AI.vi. Name mangling refers to an automated name change done by the compiler to prevent incorrect linking due to name conflicts in languages that are not as strict with dependencies. Often names are mangled into formats that are not very readable. Current Gen LabVIEW doesn’t, as far as I know, do any sort of name mangling. LabVIEW just flat out prevents you from using things with the same (fully qualified) name. You make a valid point Dave. Thank you for pointing that out. It has been a very long time but I believe I learned the term “Name Mangling” in an early LabVIEW Champions meeting in the context of Current Gen. I will defer to an NI to clarify that point. Coming from a fellow LabVIEW Champion, … I can only thank you again! Ben send me a macro for that! One thing I think of when comparing classes and libraries – classes not only add polymorphism but also instance’d wire data allowing me to replicate multiple components (eg 2 x “DO”). Libraries would have to be manually designed with this in mind by the developer which is possible but a bit unwieldy. …classes not only add polymorphism but also instance’d wire data allowing me to replicate multiple components (eg 2 x “DO”). Libraries would have to be manually designed with this in mind by the developer which is possible but a bit unwieldy. Good point. If we know there will be a need to for multiple instances at design time that would suggest using LVOOP and classes. But we do not know that at design time and only learn latter, using Libraries will give us a head start if we have to convert to LVOOP provided the Library is written properly. Hi Ben, thank you for the nice post. Is there any chance of getting some higher resolution pictures though? It is somewhat hard to relate the text to what is hidden in the pictures behind the pixelation. Yes those low res image are lacking! And ask that he send you the high res images.